In this post we have covered only points relating to benefit of house loan under section 80C.we have tried to cover all the important issues but if any point left or you have different thoughts than ours please record in comments section. 2 The limit of Rs 150000 as above is total limit u/s 80C for all type of savings ,plus section 80CCC(pension policy) plus u/s 80CCD (Contributory Pension Plan). Means the aggregate amount of deduction under above referred sections can not exceed Rs. 1,50,000. 3 The payment of loan should be made towards cost of purchase/construction of new residential house property. 4 The house property income should be assessable in the hand of assessee in simple term assessee should be the owner of the house property. 7 Housing loan benefit for more than one house can also be claimed. 9 The tax benefit under section 80C is available on residential house property only and not available on commercial house property. Public company formed and registered in India or co-operative society with main object to provide long term finance for construction purchase of houses in India. Assessee's Employer if public company or public sector company or university established by law or a college affiliated to such university or local authority or co- operative society. 11 The benefit is available only to Individual assessee and to HUF assessee. 12 The benefit is available on payment basis ,no matter to which year payment is relates to or payment overdue or not. 14 The Benefit under this section is available whether residential house property is rented or self occupied,but House must be completed by the end of the previous year in which deduction is to be claimed . 15 Pre EMI paid in a financial year are also eligible for deduction if house property is completed by the end of financial year. 16 Stamp duty, registration fee and other expenses for the purpose of transfer of such house property to the assessee is also eligible for deduction under this section even assessee has not taken any loan . 17 There is no requirement that for loan ,house property must be mortgaged to the institution from where the loan has been taken ,but it should be used for the purpose of purchase /construction of house property. Have any doubt or other view on above points ,Please comment. Sir I have purchased flat for 12,25,000/- on 29-11-2009 through bank loan. For this now an amount of Rs.7435/- is being paid towards Principle + interest. In this matter please send the answers for my questions. 1. How much amount can I claim under 80 C? 2. How many years can I avail this opportunity? Out of 7435 ,Interest amount can be claimed as a interest on house loan and if house is self occupied it is shown as minus income from house loan and reduced from your income . Hi, I have a property on which have taken Home Loan (completed but not occupied). And staying at a rented property. Can I avail both Home Loan excemption and HRA exception? Both properties are in the same City (Delhi). If yes, then request to share the link to the section of this. Dear sir, I'm constructing a house where EMI will commence from Jun'12 though my occupancy starts from Dec'12. At the same time, I'm paying EMI on my current residence where I'm co-applicant along with my father. Further 80C limit is for all the houses together .However interest 150000 limit is for only self occupied house ,if house is rented then there is no such limit . Hi, i have purchased a new flat(still in construction). i have taken a loan of around 10,90,000. i am paying EMI of 17,520. i have applied for tax claim based on FY 2011-2012 for this FY also. There is a change in intrest amount and principal amount in EMI but not the actual EMI amount (17,520). is that something that i have to make changes in tax claim for this year 2012-13. Appreciate your help in helping me out with this problem. To start with, I bought a 3bhk flat with reputed builder in Noida in the DP plan for Rs 43 lacs in Sept, 2009..For this i took a loan of Rs 30 lacs from the bank & paid rest myself (12 lacs). My property papers were subsiquently kept with the bank. Now, Since the construction of the new flat is delayed as per the construction schedule, the bank is not swapping the property papers of the loan since the LTV ratio is not favourable. They have agreed to transfer this once i make a few future installments on my own or prepay a certain amount back to the bank. The new flat is only likley to be ready in 2015. Given this scenario, request your expertise in understanding the Tax aspect of this transfer. Will i be able to claim tax benifit from 2009 to 2015 for the flat since this is technically a property swap case? Do i make the pre-payment of the required amount to the bank & transfer the papers quickly? Your comments /advise will be highly appreciated. Thanks! Yes it is a property swap case but from this swap you have not gained nothing. You have purchased 3BHK and sold the same at cost price.I Suppose the price offered to you for 4 BHK flat is same as it has been offered to person paying in cash without any swap.In simple term you no discount has been given to you on 4 BHK due to swap. Regarding House loan benefit ,in my opinion one can not claim house loan benefit unless until house is completed .In your case house will be completed by 2015 so till then you can not claim house loan benefit. I Primarily did the house swap due to bad location of the previous flat & some additional discount on the new flat. However, my Question is whether i will be able to claim the tax benefit for the entire loan or only the loan paid for the new house after it is delivered in 2015.Also, in your opinion, should i make the pre-payment of the required amount to the bank & transfer the papers quickly? Is there a benefit in that? First is loan repayment u/s 80C ,which is not available in construction period and available after the house is completed. post construction period available in same period for which it becomes due. If you got flat's possession in August then you can claim interest for the full year i.e interest from 01.04.2012 to 31.03.2013. Further as I have earlier replied you that your second house must be let out otherwise it will be deemed let out and you have to show notional rent income second house. Are any deductions available for "Commercial property" u/s 24a? If property is not used for own business then 24a is available on commercial properties also. could you please give me some relevant case law or where is it mentioned in the act? I have already taken H/Loan and getting income tax benifit. As I am not living in that house and living in a rented home. I am even getting HRA excemption. Now I have purchased a home in another city and would like to club both the interest part for the benefit u/s 24. Also I see that if have 2 houses(both rented) the maximum deductabile is Rs. 1.5 Lakhs under Section 24 of the Income Tax Act. But if we have only one house and if I have rented out the house, ALL interest paid (even if it is more than Rs. 1.5 Lakhs) is deductible from the rent received. Please correct me if my understanding is wrong. 1.5 limit is only for self occupied house if house is rented then there is no limit for interest so it can be deducted without any limit . how to get HRA exemption...when i am claiming tax benifit for negative income from house property. i am not staying in the house, do i have to show it as a rented house , if so will there be a tax on the income from house property..how much? Under section 24b, does the limit of Rs. 1,50,000/- apply to commercial properties as well? if so please quote the relevant section or case law as well. Hi. This question is not related to this current post. However, I would appreciate it if you could help. We have just bought a house and are going to register it shortly. The sale deed is in my spouse's name. Can my name be included in the registration papers, or can it only be done in my spouse's name? Thank you. Just to clarify, unless we include my name in the sale deed, we cannot do so in the registration of the house, right? Hi, I have a query regarding limit of 1.5 L..
1) Can both of us claim for deduction for interest on loan from income tax?? 2) If both can claim the interest deduction then what would be the limit?? Is it 1.5 L individually (total 3 L) OR Only 1.5 L (total- for both).. I have booked an under construction flat in 2010. Construction is still going on and possesion/registration is expected in 2013. I want to know if I sell this flat now then what are tax implications for for the gains I make ? Also is there any way of saving the income tax ? Will buying another house help like in case of long term capital gains ? As the property holding period is less than three years it is covered under short term capital gain .Short Term capital gain is taxable as per normal tax slab and is to be added in your total income. Further it can not be saved by investing in 54,54EC,54F section .One way to sav it is to sell a property where you have a loss so you can settle STCG with short term capital loss. Thanks a lot for the so quick reply Rajat. So If I wait for three years from the date of agreement and sell the flat, will the gains be considered as long term capital gains ? Can tax be saved by investing the gains in another property ? Is registration not mandatory for long term capital gains? I am also confused about the start date for long term calculation in case of under construction property. is it the date of agreement or date of registration ? In such cases there are different views and opinions .I am giving my opinion. You are holding not a property/Flat but a "right to own a property " as the property is non existent on date of agreement. Under income tax act "right to own a property" is also a capital asset. Holding period for under construction house starts from date of agreement as it is covered under "right to own a property". So make sure you sell the under construction property before possesion/registration and after three year of agreement. Thanks again Rajat. Yes this link is very informative. But I get an impression from this article on the link, that it does not matter if I sell before or after registration/possession. Only important thing is duration of holding which is calculated between sell date and allotment date. But from your reply it seems that I need sell before possesion/registration. Or am I missing something obvious ? This is important for me as I will not be able to complete 3 years from agreement/allotment without registration/possession. I have already cleared you that there are difference of opinion on the issue . I have not pressed on my opinion so I have given you link .Now you can take your informed decision or try to research more on the topic. I took a home in my native place (in AP)in 2006 and took housing loan for the same and given it for rent. I am paying an interest of around 1.65L for this housing loan. Now, I purchased one more flat by home loan in Bangalore and residing there. I am paying another 1.8L interest for the same. Can you please tell me how much amount of interest can be shown as loss of property??? For rented house you can reduce full interest in your case 1.65 L and in case of self occupied house maximum 1.5L so in total you can reduce 1.65+1.5 =3.15L interest from your house income. So, for my ITR returns, I should use ITR1 or ITR2??? I have purchased by home in Jan 2009 for 12.5 lacs and sold it for 41 lacs in April 2012. Pls can you let me know what will be the tax implication ? My salary comes under bracket of 10 %. From available proceed I have booked another flat in May 2012 worth 36 lacs…I have taken home loan of 12 lacs and its EMI has also started from current month. I am planning to sell that home too before possession ( ie while it is under construction) in Feb 2013 for around 40 lacs. Will I be charged LTCG ? Can I claim interest paid for my new flat in any type of deduction ? What things needs to be taken care so as to have minimum tax charges ? I have taken 25L loan for home construction and the process will complete in 3 months. The EMIs will start from April 2013 (because of the moratorium period). Can you let me know if i can get any tax benefits, in this scenario ?? Yes , you can claim tax deduction of interest as well as deduction of house loan repayment u/s 80C. 1) What is the amount that I can claim from the principal amount paid so far against 80C for the FY ended Mar 2012? 2) How can I claim the interest paid so far to get the maximum benefit to me? First of all ,as per section 24 ,Interest is allowed on the accrual basis not on paid basis . So to answer your query I assume that interest paid and interest accrued is same. Further interest portion have two parts. Since this house is your second house this house will be treated as deemed to be let out and you have show reasonable value of notional rent income for March 2012. However you can reduce 30 % of deemed rent as repair and maintenance and interest without any limit. Moreover as it seems that your house rental income will be lower than interest paid on house loan ,so you can set off (adjust)negative income from house loan with your any other income. I assume it will be fully set off with your other income , if not then you can carry forward loss and can adjust the same with House property Income for next eight years. Kindly take consultant /CA help. I have a house for which the home loan is cleared. I am planning to buy another house under mine and my wife's name. Loan also would be on both of our names. Both of us would like to claim 100% of the interest on EMI on the second house. Can we do it under section 24? If yes can we move into that house and still claim the same? Both of you can claim interest on home loan in your house ownership ratio.If you are owner of the house 50-50,then you can claim interest in 50-50. Further for emi repayment you should open a joint account ,Issue home loan account cheque from joint account. contribute funds in joint account in the ratio of house ownership and claim repayment in ownership ratio. Thank you sir. While i claim the interest in the mode you mentioned, can I stay in that house? You can stay in any house or can occupy both at a time ,but in your case one of the house will be deemed to be let out and you have to shown rental value as income for that house. Thank you sir. The house where the loan is cleared, my parents will stay and I will not get any rent on the same. I guess I can show that under loss of income on property. The new house, where I'd be staying, I and my wife will claim the tax as mentioned by you (second house full interest claim). Please let me know if get tax benefit under 80C and 80D for the property which is not yet handed over to us and registry is expected to be done in next FY. if rent is actually received then it can not be self occupied . However as the rent paid in case of self occupied house is much higher you should also give it on rent to claim full interest benefit. Hope you have received the message i would like to convey indirectly ? I stay in Mumbai. I have recently purchased a flat (in October 2011) in Mumbai with a loan amount of Rs 64 lakh. The flat is jointly owned by my wife and me, although the sale deed does not mention the proportion of the ownership. The loan is a joint loan with my wife and is paid through my salary account which again is a joint account with my wife where my wife contributes Rs. 25000 every month through ECS. The lending bank is the same as the bank where I have a salary account. I am myself staying in the flat in Mumbai provided by my company. I have given my purchased flat on 11 months lease for a monthly rent of Rs. 31,000, with effect from May 2012, which again is credited electronically to my salary account. My wife has been claiming HRA from her employer till now. I have got a provisional interest certificate from my bank advising that for 2012-13, the Principal component of my loan is Rs. 1,036,53 and Interest component is Rs. 6,63,099. Now I need to submit to my employer my proposed investments for 2012-13 for the tax purpose. Can my wife and me both claim tax deductions Section 24(b) of the Income Tax Act for the whole amount of the interest component (50% each and not restricted to Rs. 1,50,000 each since the flat has been given out on rent) net of the income from housing (as 50% of the rent received for each of us)? The answer is yes, You and your wife can claim interest amount without any limit as the house is given on the rent . As the property share has not been defined so it have to be taken as 50 -50. Calculation of House property . so both of you can deduct 212199 rs from salary income by showing negative house property income . Note :you have not mentioned about loan installment amount.From bank int and principal amount it seems to be 64000 per month as your wife is contributing 25000 so he should contribute 32000 and must contribute to you towards (less paid in earlier installments)old outstanding against her. secondly amount contributed in house other than bank loan should also be corrected in ratio of 50-50, if not earlier done .So receive amount from her or vice versa. I booked one flat in 2010, currently it is under construction. I had taken home loan of 15,00,000. As the construction progresses the bank gives me the cheque every month. Currently i am paying the interest on the paid amount and it increases every month. How do i claim the interest amount under the tax exemption. I want to show one property where i pay more interest as deemed to be let out -is it possible as i would be staying in that property,first property also not let out as my family stays in it. Kindly advise how to show notional rent,what is the criteria for notional rent to be declared. Hi, I purchased a Flat in Bangalore and registration done in Jan-2012. Currently I am staying in the same flat. My query is whether we can get exemption in IT on stamp duty and registration charges? If yes, could you let me know how to claim (what documants I need to provide to IT dept.) and Which ITR I need to file. You can claim deduction under section 80C up to 1 lakh rs . This 1 lakh limit includes gpf, ppf, nse , lic etc also. so overall one lakh rupees deduction can be claimed. A. FOR INTEREST BEING PAID EVERY YEAR . B. FOR REPAYMENT OF PART OF LOAN EVERY YEAR. For loan taken from friend for house , no benefit under section 80C for loan principal payment. However interest can be deducted up to 150000 maximum as house is self occupied . Interest deduction is available on accrual basis whether payment has been made or not. you should arrange copy of your account in written showing principal and interest due and amount paid during the year and balance . Further pls note that all money has been arranged from friend in white and they have properly accounted for it in their respective books. I took a home at my native place and i have a home loan availed for the same. Currently i am staying at Bangalore on rent and i don't have any income my home at native place as my parents are staying there. Hence i claimed benefit for both home loan and HRA. I would like to know which ITR(ITR1 or ITR2) i have to use while filing returns. I have following queries by seing your blog..
1. If you going to fill your ITR by efiling mode than there is no need togive any documents than how income tax department come know that at what date you got possession with resistration ? 2 I have two houses and both are rented while I am living in govt quarter so do not get HRA in salary. In this situation which ITR form need to be fill for ITR ? 3. One house is with my name and other flat is resistered with name of myself and my spouse. In resistration share of parnership is not defined. Whole EMIs(of both houses) are paid by me. Now My wife has started to give coaching, but she is earning only 50000 RS per years and she is also going to fill ITR from this assessment year. She will not claim any intrest benifit. Can I get intrest lost benifit for both houses ? Even my wife is co-applicant in one flat, can I claim 100% intrest loss for that property as I am paying 100 % EMI ? What is methord to convey to ITD as I am going to opt effiling process ? Pl suggest best way in which I get maximum benifits. 4. As you know that we could not rented both houses through out 12 month because of 11 month aggement we are generally doing. So practically we got 10 to 11 month rents. How it can be reflected in ITR form ? 5. I requasted to go through the HP(House property) schedule of ITR-2 and suggest how to fill as per my above situation. 6. Can I get benifit intrest loss of 300000 by both ITR(my & my spouse) as per above situation ? 7. what is notional rent ? 8. As I am not living in my any of the houses could I get benifits 80 C ? 9. What is the meaning of ” letable value\rent received or rent receivable” ? Which is ask in ITR-2. 10. What is the meaning of ” the amount of rent which can not be realised ? which is shown in ITR-2 form. P l reply urgentaly as last date for filling up ITR is 31 July,2012. I bought an apartment for Rs 44 Lakh. Loan amount Rs 32 Lakh and balance from savings. The apartment was put on rent in Dec 2011. For the FY 2011-12, the bank sent me interest statement that indicated only interest (under Pre EMI) and NO principal. The amount is approx Rs 1.10 Lakh (Pre EMI). B. This amount X is subtracted from the Pre EMI amount (say amount Rs Y) to get amount say Rs Z.
D. This amount Rs Z (negative) is then reduced from my gross salary. Please comment whether the advice rendered to me is correct or not. I have been searching on the net for a solution to my issue. I hope you could help me in this. My brother and I have bought a house last year. since ours is a joint family, It has been registered on my father's name as he is the head of the family. We have taken loan of 20L for the same which is also on my father's name however I have been paying the EMIs for the loan. (Actually, I am transferring the EMI money to my brother's account monthly since his account will directly be charged through an ECS on monthly basis). 1. Will I be able to get the tax benefits in this case ? 2. 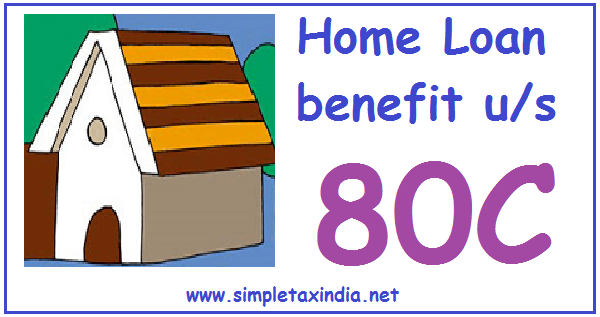 Please suggest a possible way which will enable me to avail the tax benefits on my home loan. 3. I read somewhere that if my father declares me as a owner of the house, I can avail the tax benefits. if that is true, Please suggest me how can the declaration will be done. The house loan benefit is available only if you are owner of the house . so first you should insert your name in house registration then only you can think of taking any benefit .even after that you can take benefit according to your % share in the property. You have already complicated you transaction. I have purchased a flat and have posession letter from builder as on 25th Feb 2012. Also, this property is let out from 17th Mar 12. Can I claim the Interest paid for the above property for the entire year Apr-11 to Mar-12. Also, since the property is let out from Mar-12, can I claim loss for the period it was vacant? Yes , you can claim interest for whole year 4/11 to 3/12 in Fy 2011-12 return and can deduct it from rent received for 17.03.2012 to 31.03.2012. Further you can claim vacancy benefit also . In fact house valuation (ALV) should be shown only for actual let out period. Moreover Interest accrued up to 31.03.2011 on house loan can also be deducted in 5 equal installments starting from Fy 2011-12 it self.That is in addition to interest from 4/11 to 3/12. Housing loan taken in may 2011 and the house got completed in may 2012. I have paid 90000 as interest till february 2012. Pls tell which ITR form to use and where to fill in these details to claim interest rebate. You have not provided complete income details . If you have house property income and salary income then use itr-1. I came to know that I had done one small mistake in income return for assessment year 2011-12 due to lack of knowledge at that time. Sir As a part of transparency Can I correct or reflect it in ITR of assessment year 2012-13 ? Second I did not take advantage of tax benefit against home loan in assessment years 2010-11 because at time I had overlook the amount as it very small (I got possession in Jan-10 and it is old house so no any waiting period) Can i reflect in current ITR ? My aim is to keep every thing transparent even I have to more tax. Further old period interest can not be claimed in present itr. For assessment years 2011-12, I got possession of one very old tenament(which is rented and rent also shown in income for ITR). For new flat I did not get possession(made agreement on 01/06/11). At the time of ITR filling I came to know that I could get intrest benefit of any one property so fill intrest lost (against flat) as Rs 83647. While intrest lost against old tenament was Rs 62449 which is not reflected in ITR. This was happened due to lack of knowledge. Can it be reflect in current assessment or any other amendment can be done ? You may revise your return for Fy 2010-11(if assessment is not completed till now) but you have to pay tax on difference along with interest. This error can not be corrected in present year's Income tax return. Further I don't want to d'''''se you but my advice is forget about it. Thank a lot I will remember you throughout life time. We will remain in touch via your valuble site. 1. Should I go with home loan from financial institution and can claim tax deduction on interest or I also have an option to get loan from a person at similar rate at which banks have been offering. If you have intention to sell house with in three year then no benefit is available to you under capital gain tax. Further house loan benefit available under 80C also be reversed. I have started to work as a teacher in private primary school. As you know that it is un secure job so I do not get any salary statement or form no 16. Currently I earn 72000 per years. I want to buy a small house. Can I get home loan benefit ? I never fill ITR but this year I want to file ITR. Can I file ITR with above situation ? Pl suggest.. Yes ,you can file income tax return , file ITR-1. Further you should request your employer to release salary through bank and issue a salary statement. interest on housing loan to be shown under which head in ITR I while efiling? Also how does the income tax department verifies the information submitted in e filing of ITR I? is there any need of attaching form no 16? For Interest on house loan minus income ,Sr number 2 ,Put minus sign against the amount. No need to send ,attach like form 16 with income tax return. my tax deducted at source u/s 192(1) is 4700.
my gross total income is 337765.So how would be my ITR I look like i.e where should i show above mentioned amounts? I want to file my return by e filing.whether the acknopwledgement should be printed in colour or black and white? in ITR I there is a column (J32)for signature on "Taxes paid & verification" sheet stating 'sign here'.What does it meant & how to sign there if i am opting for e filing? How can i obtain digital signatureAnd use it for ITR I? My form 16 shows only my contribution of CPF and none is shown as my employers contribution? So what should i fill & where in e filing of ITR I? Only green field can be filled by user . This(j32) is not required field.Further if employer share is not known then fill your own share only. sir i am a salaried person and have house loan (10 lakhs)from LICHFL in FY 2011-12 for the renovation of the existing(owned and occupied)house, for which i am paying regular EMI of Rs.15355. is there any clause in 80c from which i can get tax benifit in interest and principal amount for the current FY. As Per Rule Principal repayment(80C) is not available on renovation, alteration, addition , repair . It is available only on construction of new house. However Interest deduction can be availed u/s 24 up to 30000/- per year.Show minus income from interest under house property head. I have a Home Loan where I am the primary applicant & my father is secondary applicant. My father is the owner of the house whereas i'm the income earner. Is it possible for me take Home Loan principal deduction us 80C? No ,you can not claim house loan benefit ,as you are not the owner of the house . can an assessee claim HRA and principal ded u/s 80C and loan interest deduction u/s 24c at the same time? yes , he can subject to few conditions. Whether Stamp Duty, Registration Fees, and other expenses incurred and beared by the assessee (Purchaser) can be claimed under section 80C. If it is and claimed accordingly, whether these cost can be capitalised in the cost (In future whether will form a part of Cost of Acquisition. I have taken a loan for a second home in the year 2009, and had paid registeration charges at that time. Pl advise whether I can claim the same. The house is currently under construction. No you can not claim now. It is allowed in the year of payment only . Is there a notional annual letable value needed to be shown for vacant plot of land under the section of income from house property in itr2? I am working with an MNC and as per the company policy, all the investment details should be submitted to the company by December 2011 and the tax computation will be done based on the investment proof submitted. I was staying at rented house at that time and submitted rent receipt info also. In February 2012, I have done the registration of my new apartments. This registration and stamp duty paid amount is not reflected in my Form 16. I started staying in the new apartment from April 1, 2012 onwards. While filing ITR, can I include this information also which will provide me some tax refund and Can I do the filing myself or is it mandatory that I should consult some authorized TRP since refund is involved? Please advice me on this. Thanks Raja Babu. I will file the returns today itself and will get back to you if getting stuck at some point. I purchased a house in my native place few years back for which i tool Housing loan. The loan is almost coming to closure and now there is no substantial interest component to claim for income tax. Currently, my parents stay there. I plan to purchase a second house/flat in bangalore (where i stay/work). I want to use this second flat for my own residential purpose. My question is related to claiming complete interest (more than 1.5 lakh) for this second house. 1- Can i claim the house in my native as "Self Occupied" and the house in bangalore as "Deemed Let Out" even though i will live in the second house. 2. How to really say "deemed Let Out" in ITR-2 forms and who should be mentioned as a Tenant in this case? Pls let me know your inputs. I would like to utilize the income tax provision of deducting complete interest for second house property. I have purchased a flat in Kolkata and have taken bank loan. I have also got the possesion from the builder. however i stay in Lucknow for job purpose. Can i claim deduction in Income Tax u/s 24 for Rs.1.5 lacs interest paid ad also claim HRA for rental i am paying in lucknow? I have already one flat bought though loan in 2003 onwards and i repaid all instalments and loan completed. Presently i am staying in that Flat. I am planned to purchase another one flat by loan in another city (Chennai) which is in construction phase. The Flat expected possession shall be in April 2014. Shall i get IT rebate for the EMI payment. How it can be claimed? What shall be limit for that? Yes you can claim benefit for new house also. But the new house will be deemed to let out or you can actually give you this on rent . In such case you can reduce interest without any limit. and principal repayment up to 1 lakh u/s 80C with all other saving instruments. My que is: Can we both get deduction for interest and principle amount on loan repayment amount?? I want to mention that the property is on my name and loan is on both name, also i have received letter from LIC stating loan is on jont name along with repayment schedule for 1 yr. Repayment installments is being made from my salary account.my wife is transfering amount to my salary account every month for loan repayment. 2) If we both can not claim this due to property is on my name, is there a way we can do this?? You can claim this only if house is also on your joint name ,otherwise there will be problem in claiming the benefit to your wife .so it better if you are living in housing society then add your wife name also in the house and then claim benefit in the ratio of ownership of the house. hi, I have purchased a flat for Rs.27 L and got home loan of Rs.22L. I have got the property registered by the builder although i havent got possession. I will get possession by march 2012. Can i claim tax benefit of Rs.1.5 L under section 24 and what document do i need to submit to my employer so they reduce my TDS. If you got possession by March ,2013 (within Fy 2012-13) then you can claim house loan benefit. To claim these benefit you should take a tentative repayment schedule and tentative interest statement from Bank and submit it to your employer. If house remains self occupied (not let out) then you can claim maximum interest 1.5 lakh per year. I had taken a house loan in may 07 and got the posession for the house in dec 2011. now when i want to claim the house loan interest element as tax benifit, I was told that since the period between date of taking the house loan and posession of the house is more than 3 years , then in that case the max benefit per year will be rs 30000/- only instead of rs 1,50000/- in case of showing the house as self occupied.pl advise. please give more details . Thanks for a quick reply. I have purchased the house from a builder. The clause of three years is being told to me because the date of posession letter ( same as the registration date on my name). How do i show when the construction was over? As the period is being calculated from the date of taking the loan to the date of posession. where the property referred to in the first proviso is acquired or constructed with capital borrowed on or after the 1st day of April, 1999 and such acquisition or construction is completed within three years from the end of the financial year in which capital was borrowed, the amount of deduction under this clause shall not exceed one lakh fifty thousand rupees"
otherwise Rs 30000/- is deducible. so from the above ,in your case period of three years starts from 01.04.2008 (end of financial year in which loan has been taken) and ends on 31.03.2011. so to claim the exemption you have to show acquisition /construction of house before 31.03.2011.
second option is show your house on rent(even not actually given) till interest benefit goes down to Rs 30000. Please give notional rent where your house is located and amount of interest due in next four-five years (including pre construction period interest) so that detailed reply can be given. I have constructed a two floor house by taking housing loan jointly with my wife and house/property is in name of both. One floor is rented out. My wife is not working and don’t have any other income. I am responsible for repayment. Is it fine / permissible to show the full rental income in my wife's name while submitting IT return as an income from housing property for one floor? And also is it fine to show loan interest under section 24? Please advise. As your wife has no income and she has not contributed any thing towards house cost/loan . So as per income ta act you are treated as deemed owner of the house even though house is also on your wife's name. so as per above all income /loss (interest on house loan) will be treated as your income only. One house can be shown as self occupied even we are not residing at house . But if you show house as self occupied then maximum 1.5 lakh interest deduction can be claimed . So it is advisable to show this house as let out and claim Full interest deduction(around 3.5 lakh) without any limit. Further you can claim HRA deduction as usual . Please correct me whereve i am wrong on the following points..
(i am confused on 3rd point .. as this property is in joint name of me and husband..... than can both of us claim part of loss from property income??? if yes, than how?? As the house property is on joint name (i assume 50:50) . Both of you should open a joint account and should contribute equally in this account and should deposit loan installment from it. as the loan is in joint name ,both of you can claim 1.5 lakh each as interest on house loan as deduction and can show house as self occupied even you are not residing in it. so with this additional information supplied by you ,showing house as let out is not advisable. further 1.5 lakh minus income from house property is deductible /adjustable in salary income also. 1) As i understood with this 3 year clause I can't get tax benefit on that short term gain of 6Lakhs (won't get tax deduction as i sold first property before 3 year of possession even-though i purchased another property within 2 months). Please confirm my understanding. 2) As per my understanding of tax benefits from house loan, I can claim only principle amount (not interest) for tax saving till i get this new house possesion. Its flexi payment plan so I opted to pay bank only EMI (Principle+Interest) on disbursed amount. Please confirm my understanding. Please let me know if above details are incomplete to suggest concrete solution. No benefit available as you have sold house less than three years even you have purchased new house with in 2 months. Further Tax benefit availed u/s 80C for old house in delhi is also taxable in the year of sale of house i.e in 2012. 2)In our view you can avail interest and repayment benefit only from the year in which house is ready to occupy. 1) As you mentioned "Further Tax benefit availed u/s 80C for old house in delhi is also taxable in the year of sale of house i.e in 2012" >>> What sort of tax benefit on old house please specify, do you mean the tax benefit i have availed on old home loan during this 2 year tenure. 2) As i understood I can't avail tax benefit on under-construction home loan interest (can be availed only after possession), can't i even claim principle of under-construction home ? 1) If a house is purchased and loan is taken on it and 80C benefit is taken for loan repayment .in such case if house is sold before 5 years ,80C benefit for repayment taken is to be reversed and added back to your income. I plan to purchase a second house/flat in bangalore (where i stay/work). I want to use this second flat for my own residential purpose. My first house is in my native place - Delhi. 1- Can i claim the house in my native as "Self Occupied" and the new house which i purchase in bangalore as "Deemed Let Out" even though i will live in this second house. As per explanation given in section 23 ,you can select any one house as self occupied house and other house as will be treated as deemed to be let out and you can change this option at later date. "(b) More than one house in the occupation of the owner for the purposes of his own residence, the provisions of clause (a) shall apply only in respect of one of such houses, which the assessee may, at his option, specify in this behalf; "
I have a query! I have taken a home loan with husband as a joint applicant. Can we both claim income tax deduction of 1.5 L each under section 24 of house loan interest payment. Also i live far from my work place around (50kms), can i claim HRA benefit also? Thanks in advance. To claim House loan benefit By both of you . You must have a share in property and your share of loan is paid by both of you respectively . if above condition are satisfied then you can claim House loan benefit in ratio of ownership. Further as you are paying rent actually , you can also claim HRA benefit. Thanks a lot for the quick response. My husband and me has each 50% share in the house. We both pay equal amount towards EMI. The annual EMI is around 4,80,000 in which the interest component is more than 3 lakh. Can we both claim 1.5 L each under section 24? Please respond. yes , you both can claim 1.5 lakh each under section 24. First of all thanks for your helps and I really apprecite this. I had purchased a flat in Pune and given on rent. I am showing rent income and also taking benefits of principal & interest deductions. Is it okay? Now I have recently booked a flat, which will be ready on March 2016. Can I take principal & interest deduction for this house also in parallel with housing loan in first flat? Presently I am staying in a rented house and taking hra benefits. This is in one city only. You can avail one or more house loan benefit at a time . No restriction on it. But you can show only one house as self occupied . I plan to take housing loan for a property which is in my father's name. The loan will be taken in my name and father will be co-applicant. In this case can i claim for income tax benefit for both principal and interest paid? The house is not in the city where i am currently working. Is it mandatory that the property where the house is constructed should be in my name or jointly in my name and my father's name. Yes , House loan benefit can only be availed ,if property is in your name or jointly owned by you. My father constructed a house at my native place. Initially he was paying interests to the bank. But after loosing his job I am paying interest nowadays. Can I get I-T benefits? If yes please tell me the procedure. I am just purchasing a home for which i am going start paying the home loan from Dec,2012. However, I am going to reloacte to this new home a year after and currently I am in a rental house where I am going to continue my stay. In this case, can I get tax exempt benefit from Home loan interest as well as HRA? Yes , you can claim both HRA and House loan Benefit. I'm staying in Chennai & recently bought a already built flat nearby the place I'm staying. I have got the Housing loan for this flat. But due to some constraints, I will not be able to move to my new flat for an year. Can you let me know whether I'm eligible for both HRA & Home loan exemption. I heard that I cannot claim both if they are in the same City & as well as the city where my Office located ? I have bought a flat which will be delivered to me in 2 / 3 years time and I am applying for Home Loan. I request your help in understanding the tax benefit provision on joint home loan. My wife is a Phd student and gets scholarship / stipened which can not be considered as a salary. She does not file IT Return as her earning is less than the taxable slab and its merely stipened. Though my own salary is sufficient to meet the EMI but I think if I can add my wife in the Bank Loan as a Co-borrower then after a year or so when she starts earning salary, then she will also be able to avail Tax Benefit. 1. Can my wife be allowed as a Co-borrower in the Home Loan application by Banks when she is merely getting Stipened / Scholarship as on date? 2. If my wife can not be added as a Co-borrower as on date then can I take the loan only in my name now and later get her included in the same. Will the bank agree to add a co-borrower at a later date, how complicated will be the procedure and what legalities will be involved. 3. I understand that the said flat shall be in joint names which we will get included in the Agreement with the Builder and the Tax Benefit can be availed in the same proportion as the share in the flat. I wish to keep the Share Ratio as 60:40 thus do I need to mention this Share Ratio in the Sale Agreement with the Builder or do I need to prepare a separate agreement. We have purchased a House Property (plot) from state govt last year for which we are paying installment of Rs 20,000 every month.The plot is in the name of my father who got retired few months before.Now the installment is paid by me. Being a spouse, can i claim for tax rebate for the installment paid ? no , you can not claim rebate/deduction under income tax as the house is on your father's name . Are you sure? because Banks do provide loans for purchasing of plots and if we are re-paying any short of loans through installments then the interest paid by the individual (for that particular loan) can be considered for tax rebate. Even I am not sure on this.Pl suggest how can I get the benefits for that money that are being invested for the land property.If atall we can do anything, what are the procedure? I have bought one underconstruction flat in Mumbai but now due to my job change, I had to relocate to Delhi where I am staying on rent. Since, My property is in mumbai and not yet get the possession but I am paying interest (EMI). Please suggest can I get a tax benefit of both on EMI & HRA (in Delhi)? I am staying in a rented premises. Can you please let me know whether i can avail upto 1 laks on principal on first flat, and 1.5 lak on interest for first flat. for second flat - maximum interest waht i am paying? i am aware that the rental income what i am getting will be taxable. and also can i get the HRA exemption???? 2nd flat - same at my work place and i am planning to reside in this house. interest paid u/s 24 for second flat and also can i avail hra exemption? My wife owns a house which is currently let out and she has taken the home loan for the same on her name. She is planning to take a break from work and I would be paying the EMI once she quits the job. What is the way by which I can claim tax benefit for the EMI's I am going to Pay? Does she need to gift the house to me and add me as co applicant for bank Loan? Please advise. I have taken a ready possession flats in Pune in March 2011. I have not clamed any registration charges or any other charges for tax benefit and I have paid around 20, 000 tax in that year. Can you please guide me what should I do? Can you please tell me how much tax benefit I will get and which section? I have purchased a flat in mumbai in 2009 and it is rented for 9000RS/Month. now my load repayment is less 1.5lac. 1)loss on property is coming in minus(-) value. pls provide interest and principal break up. I am co-applicant with my father for the under construction house where I already started paying EMI. Please clarify whether I can get benefit under both sec 80C and Sec 24? My father going to possess the house on Feb 13 and I am in rented house at another city. 1. Property is in name of my mother only. 2. I am primary applicant & My mother is co-applicant in Home Loan. 3. EMI is payed by me. Can my mother claim income tax benefit? I have recently purchased a second house. I have 10 months of EMI left for my first house ( co-owned by my wife). can i show the new house a my residing house and start claiming the tax benefit. I have recently purchased an under construction property by taking home loan from a bank. However, I have started my full EMI from first month. Is there any provision for me to claim any tax benefit in the under construction property or I can only start claiming it once I get the possession? Also, secondly, Can I show the stamp duty and registration charges for tax saving in 80 C (e) Housing Loan Principal section for the current financial year? I have purchased an apartment under construction from the builder by entering into an agreement for sale. The builder is now issuing sale deeds for these apartments. I needed to know if I can enter into the sale deed considering that the apartment is taken on a housing loan. If not, what is the option and alternatives available considering that it may be difficult to get the builder at a later stage once all sale deeds are executed. I do not want to get into a situation wherein I would like to sell my apartment but will not be able to do so due to need of a sale deed which needs to have stamp duty and registration. It is to be noted that the agreement for sale with the builder had stamp duty and registration paid. I have taken home loan at my home city in Andhra Pradesh where my mother and brother stay. Now i have applied home loan to purchase a flat in Gujarat where i work and am going to stay. Now if i get the flat registered in this month ( flat is ready to occupy )can i claim income tax rebate for principal and interest for both loans? And would i get any benefits for the registration and stamp duty? Please reply. you can claim house loan benefit on both the houses but you can not show both of house as self occupied and one of them will be treated as deemed to be let out and you have to show notional rental income . 1. The Stamp Duty & Registration Fees that I pay, is it eligible for Tax Deduction under Section 80C?I have already exhausted my 80C limit through PPF, does that mean that I would not get any tax benefit on Stamp Duty & Registration Fees? 2. I have also paid 3.09% service tax because it was an under-construction flat. Is there any tax benefit on that amount? 3. I live in a rented accomodation with my parents? Can I claim tax deduction by paying rent to my father for the apartment , though he himself is not the owner of it (my father in turn pays tax on that rent as his income)? Thanks for your prompt reply..thing is the rent receipt is in my father's name & the landlord does not want to change it to my name..in that case is the above option feasible or legal? I live with my parents. My father has an ancestral house in the same city, which is lying vacant...can I show in income tax that i pay rent to my father for that house, although physically I don't live there? If you want to take risk ,then why to choose father's house. I would want to do it because it seems more plausible and believable. Since my father doesnot have any income, he will not have to pay tax on the amount of rent i pay him and get tax deduction. Is it mandatory that you have to stay in that house throughout? (since it is lying vacant I can always stay there twice/thrice a week). Hi,I have closed my housing loan in October 2012 by paying 4.32 lakhs.The bank has given me the provisioanl certificate only for the amount payed before October 2012. Even if I closed the loan, the money i have payed towards closing is also a part of loan payment right? Then why bank is not giving certificate for this amount. Please guide me. Bank should Provide complete certificate. However if you have transferred loan to other bank then bank is right. I have purchased a house directly from Greater Noida Authority in their BHS 13 scheme - in the Half yearly installment option. I pay the Greater Noida Authority half yearly installments by myself - which constitutes the principal and interest component. I have taken no loan from any bank. My question is can I claim tax deduction for interest paid to the Greater Noida authority under section 24? I got the possession of the house this year. i have purchased a 2bhk on loan on which i claim deduction under Section 80C on the principal component and interest under Sec. 24. now i wana knw whtr i cn give dis flat on rent and hw wil i show my rent income for IT purpose and whtr i can claim deduction under Section 80C on the rented house. 2.30 % of rent as standard deduction after deduction 1 as above if any for repairs irrespective of exp incurred. I had a home loan which I closed earlier this year. I have been staying in this home and claiming IT deductions. I had taken a home loan in June 2011 for a under construction flat. The construction of the flat is almost completed however the registration of flat under my name is expected to be done in April 2013. The builder however is ready to give possession letter for the flat in March 2013. Please suggest if i can claim IT deductions in FY2013 on the basis of possession letter but without registering the flat under my name. Secondly maximum deduction under 80 C for interest payments is Rs 1.5 lacs. Does this include the 1/5th of the construction period interest as well? If yes, then it means that i would not get any deduction on interest paid during construction as interest for current financial year is already more than Rs 1.5 lac?